The universe looks like it was designed. This page outlines the scientific facts about universal laws and numbers that seem to fit together just right to produce life. Most scientists believe it is enormously improbable that this could happen by chance. The universe is complex, yet its laws are simple. It behaves in an orderly manner, laws are consistent all over. It is organized, so that everything works together. Cambridge cosmologist Brandon Carter noted 40 years ago that what we observe in the universe is precisely what is necessary for us to be here to observe it. This is known as the “anthropic principle”. Physicists have discovered a long list of particles that make up atoms and the universe, four main forces or “interactions” (the strong nuclear force, electromagnetism, the weak nuclear force and gravity) which govern what occurs, and a bundle of constants with particular numerical values. Some universal laws and values are finely balanced – even extremely small changes would not allow important things to have occurred. The chemicals essential to life must exist in the right quantities and locations to allow life to evolve. If the universe consisted of only simple elements such as Hydrogen, Helium and Lithium, complex organic chemistry would not be possible, making intelligent life impossible. The laws of physics must allow atoms to be constructed so that biochemistry is possible. The universe must provide a suitable stable and long-lived environment for life to evolve safely. This probably means, solid long-lived structures, heat sources, etc. The following are the most commonly mentioned examples of “fine-tuning”, however there is argument about whether they are all independent, and the possible reasons for them. The chemistry of the universe and of life is determined by the structure of the atom and the strength of the fundamental forces. In the standard model, there are 6 varieties of quarks and 6 varieties of leptons (which include the electron), plus their antiparticles. Protons and neutrons are each composed of three of the lightest two quarks in different combinations, giving them different masses. Protons, neutrons and electrons make up almost all matter we can see in the universe. Quark and electron masses have to be each within very narrow limits (about 1 in 10^10 of the possible range) to allow the chemistry needed for life. Outside these limits, the universe would be composed of either protons and electrons (i.e. hydrogen atoms) or neutrons, neither of which allow any chemistry and hence no life. Electrons belong to a class of particles named “fermions”, only one of which can be placed in the same state. Therefore electrons exist in distinct orbits around the atom’s nucleus, which is the basis of chemistry. If electrons were not fermions (most particles are not), then they would sink to the lowest orbits and there would be no chemistry as we know it. The Higgs boson is actually a quantum field, and particles get their mass when they interact with the Higgs field. To get the masses of the fundamental particles requires the Higgs field to be fine-tuned to 1 in 10^16. The strong nuclear force holds protons and neutrons together in the nucleus of atoms and hence determines the amount of energy released when nuclear fusion occurs – for example, the fundamental nuclear fusion of hydrogen to helium, occurs in stars and provides most of their energy. If the strong nuclear force was a little weaker, most atoms would be unstable and the universe would be composed of hydrogen, which could not support complex life; if only a little stronger, all the hydrogen would have become helium very early on, and hence there would little or no water and no fuel for stars. The strength of electrical forces between charged particles is determined by the electrical fine structure constant, which has a value of about 0.007 of the strong nuclear binding force. If this constant was larger, protons in the larger nuclei would repel each other and overcome the strong nuclear binding force, so that only lighter atoms could exist. In the early moments of the big bang, particles were created that eventually formed into the simplest atomic nuclei: hydrogen (1 proton) and helium (2 protons and 2 neutrons). All the other 92 elements, including those necessary for life, were manufactured much later, by nuclear fusion in stars, and then flung out into the universe by exploding supernovae. There are many parts of this process which depend on extremely fine-tuning. The weak nuclear force is involved in the radioactive decay of some particles, including the transmutation of protons to neutrons. It controlled the ratio of protons to neutrons in the life of the universe, and hence the ratio of hydrogen to helium. If it was only slightly weaker, all hydrogen would have become helium and we could have no water; if only slightly greater, there would be only hydrogen and no helium, which was necessary to later produce the more complex elements necessary for life. All the more complex elements were formed inside larger stars with higher internal temperatures. But for this to occur, two difficult steps need to be negotiated. Two helium nuclei have to collide and combine to form beryllium, followed by collision with a third helium nucleus to produce carbon. But beryllium is extremely unstable, and the process would rarely occur except for the “fortunate” fact that carbon has a resonance (a natural energy level) that exactly matches the energy of the particles involved and so facilitates the process – if the resonance level is just 4% lower, no larger nuclei could have formed. Another helium nucleus must collide with a carbon nucleus to produce oxygen, and this time the oxygen resonance is just right to reduce the conversion and retain a high percentage of carbon necessary for life. So the formation of carbon and oxygen is doubly fine-tuned, with the resonance levels sensitive to the electrical fine structure constant and the strong nuclear interaction. Once carbon and oxygen were synthesised inside stars, heavier nuclei such as neon, magnesium, silicon, sulphur phosphorus and finally iron were produced by nuclear fusion, and then the fusion process ended. In many stars, that was the end and the stars collapsed under gravity. All these elements would thus not be available for the formation of life on planets. However for very large stars (say 25 times the size of the sun), this collapse created such great temperatures and pressures that heavier particles and neutrinos were formed and an explosion occurred. 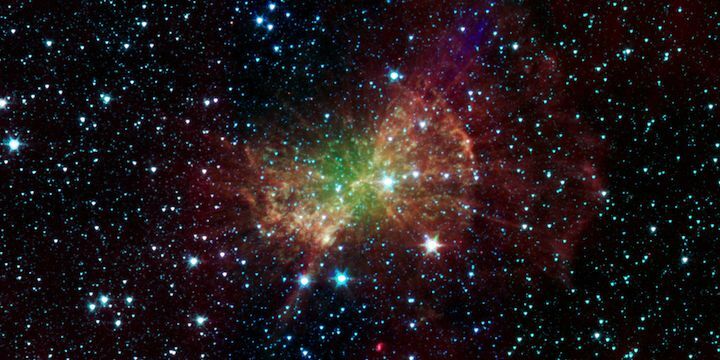 Such stars would become a supernova and, assisted by the neutrinos, blow a substantial portion of their mass, including all the newly created elements, into space to be available for future planets and life (so we are all literally “stardust”!). Since the big bang, about 14 billion years ago, the universe has explanded to its present size, and the original matter has been distributed into galaxies, stars and planets. But the formation of our present universe, which can support life, is the most amazing example of fine-tuning of all – it required very exact initial conditions and physical laws. The big bang caused the universe to start expanding. Whether the universe keeps on expanding (“open” universe), or eventually collapses back in on itself due to the effect of gravity (“closed” universe), or the expansion and collapse forces are evenly balanced (“flat” universe), depends on the initial expansion energy, the strength of gravity and the density of matter in the universe. If the expansion energy is too great, everything keeps on expanding and galaxies do not form; if gravity is too great, the universe has only a relatively short life. Neither scenario would lead to life, and measurements indicate the universe is either flat of very slightly open. A number of factors are involved in the apparent fine-tuning. The critical density is the density of the universe at any time that would result in a flat universe. If the actual density is greater, the universe will be closed; if less then it will be open. Calculations of density in the earliest stages of the big bang indicate that the density was extremely close (within 1 in 1060) to critical. Extremely small differences to this value and the universe would be either too short-lived for life or matter would never have coalesced into galaxies, stars and planets. (See Gribbin & Rees reference below.) Thus either the initial rate of expansion or the density of theuniverse were extremely fine-tuned. The density of all the particles in the universe (including both baryonic and dark matter – see note 1, below) is estimated to be about 30% of critical. However dark energy (see note 1, below) also contributes to density. To produce the density required to allow our present universe to exist, the contribution of some particles to vacuum energy (known as the cosmological constant) must be negative, and the positive and negative components of the energy must cancel out precisely to 119 decimal places, yet still leave a small positive number, in the 120th decimal place! This is amazing precision (see L Susskind reference below). If the initial state of the universe was homogenous, matter wouldn’t ever coalesce, but if the “density contrast” (or lumpiness) was too great, galaxies would be too turbulent and unstable for life. The actual lumpiness is 10-5 is just right, but if it was 10-6 or 10-4 then conditions would be unsuitable. Gravity is about 1039 times weaker than electromagnetism (I have seen slightly different values given for this ratio). If it were only 1033 times weaker, stars would be billions of times less massive and burn a million times faster – and life and the universe as we know it could not exist. Antimatter sounds exotic, but it is simply a name for a particle identical to another particle, but with opposite electrical charge. When the two particles collide, their entire mass is converted to energy and they disappear. If the big bang had produced equal numbers of particles and antiparticles (as you might expect), then all mass would have eventually disappeared. But there were actually a small amount (one in a hundred million) more particles than antiparticles, a situation Paul Davies describes as “inexplicable”. Entropy is a meaure of the unevenness of heat. If the entropy per baryon (a proton or a neutron) was just a little more (1011 instead of 109, galaxies would have been unable to form. Respected cosmologist Roger Penrose calculated that to produce a low entropy universe such as ours requires selection of just one of a possible 10x, where x = 10123, absolutely astonishingly long odds, effectively zero. Since penrose made this estimate, some scientists have suggested that ‘inflation’ (a time of rapid expansion in the early stages of the universe) might explain this low entropy state, but others argue that inflation doesn’t change the basic argument. How improbable is all this? There are very few scientists who believe that the universe could have taken on its present form by chance. For example, physicist Victor Stenger constructed a computer model based on just 4 constants and a very limited range of those constants and a limited set of criteria. He concluded that with that truncated model, a successful universe was a 50/50 chance. However his simplifying assumptions have affected the outcome, and physicist Luke Barnes has published a detailed criticism of Stenger’s work. The majority view appears to be that it is highly unlikely that the universe could take on such values by chance. Paul Davies (“The Mind of God”): “There is for me powerful evidence that there is something going on behind it all….It seems as though somebody has fine-tuned nature’s numbers to make the Universe….The impression of design is overwhelming”. But can we really estimate the mathematical probability of all this occurring by chance? Mathematical probability can be calculated as the number of possible successful outcomes divided by the total number of possible outcomes. If we assume that all values within the possible range of a constant are equally likely (a big assumption, but not unreasonable), this calculation becomes the range of values which leads to a universe that can produce life divided by the total possible range of values. Some argue that it is impossible to do such a calculation, because we have no idea about the possible ranges. Some go further and argue that the whole concept of probability is meaningless when dealing with a (presumed) once only event. However others believe it can be done. Physicist and philosopher Robin Collins has developed a method to undertake such a calculation, and made estimates for six instances of apparent fine-tuning. Others, including Smolin (see above) have also attempted this. However all these probability estimates are dwarfed by Penrose’s calculation, and Penrose’s stature as a mathematician and cosmologist must lend credence to his estimate. So we can conclude that it is highly unlikely that the universe has taken its form by chance alone. The matter we can see, composed of protons and neutrons (‘baryonic matter”), makes up only about 10-20% of all matter in the universe. The remainder is so-called “dark matter”, because it neither emits nor reflects light and so cannot be seen. No-one yet knows for sure what it is (they think it may be small unreactive particles), but we know it exists because its gravitational impact can be measured. Quantum fluctuations in empty space cause particles to appear and disappear rapidly. This causes empty space to have energy (known as vacuum energy or “dark energy”) and to exert a gravitational force. The effect of dark energy can also be measured by its gravitational impact. was the universe designed for us? – it looks like it was designed, but was it? “Just Six Numbers.” Martin Rees (1999). The Fine-Tuning of the Universe for Intelligent Life. Luke Barnes. The original of a paper later published in slightly revised form in Publications of the Astronomical Society of Australia, Volume 29, Issue 4, pp. 529-564. University of Tennessee Astronomy lecture notes. Wikipedia: “Fine-tuned universe“. Cosmological Constant. “God and Design: The Teleological Argument and Modern Science.” ed Neil Manson (2003). “The Anthropic Universe“. The Science Show, ABC (Australia), Feb 2006. “The Appearance of Design in Physics and Cosmology” in “God and Design” (ed. Neil Manson). “Physics and the Mind of God: The Templeton Prize Address” 1995. Another version here. “Now is the Reason for our Discontent“, SMH, Jan 2003. “Life, the universe and everything” Cosmos #14. A critique of Davies’ conclusions by Victor Stenger. “The Anthropic Principle“, Victor J Stenger. “A Designer Universe?“, Steven Weinberg. “Cosmos and Creator“, William Lane Craig. “The Prerequisites of Life in Our Universe“, John Leslie. 10 things we can all believe? How did the universe start? Was the universe designed for us? Are our brains like computers? How do we know right and wrong? How can we test alleged healing miracles? Is faith the opposite of reason? Is there no evidence for God? Reasons to disbelieve in God? How can god allow evil? Does God hide himself from us?